The forest called 'Urwald Hasbruch' is one of the famous forest-reserves of Germany. "Urwald" means Virgin-forest, but in fact this is not a real Virgin forest: it has been influenced by man for centuries by grazing animals and cutting trees and branches. Such grazing-forests, in Germany called "Hudewald " were rather open parkland-like with old spreading Oaks, Beeches and Hornbeams. From the nineteenth century upon the grazing was stopped. In this and other cases the forest was declared a reserve and were left to nature. While the grazing and cutting had stopped the forest grew thicker and denser with hornbeams and beeches, wich can tolerate a lot of shade. Meanwhile many of the oldest trees, the light-needing oaks, were overgrown and pushed aside. The Hasbruch grows on loamy soil with a high water-table. 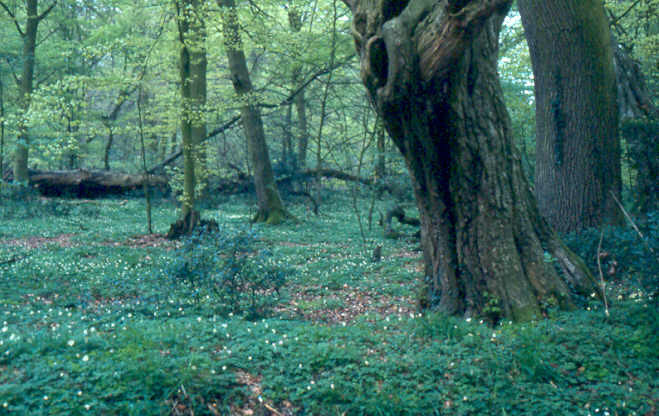 It is a so called Oak-Hornbeam forest with a lot of typical herbs on the forest floor like wood anemone, wood-sorrel, oxlip and lungwort. 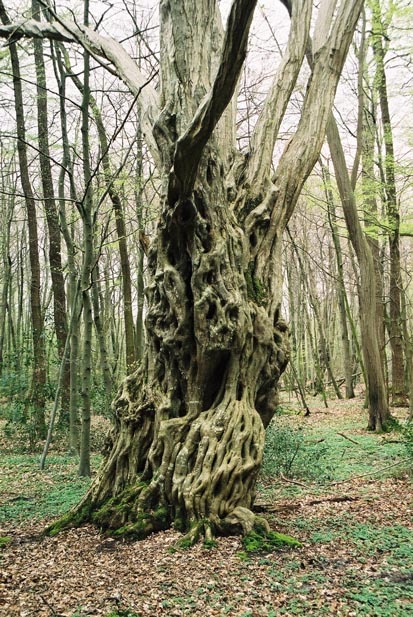 Here an old Hornbeam bending in front of a common oak. The most impressive of the pollard Hornbeams of the Hasbruch. 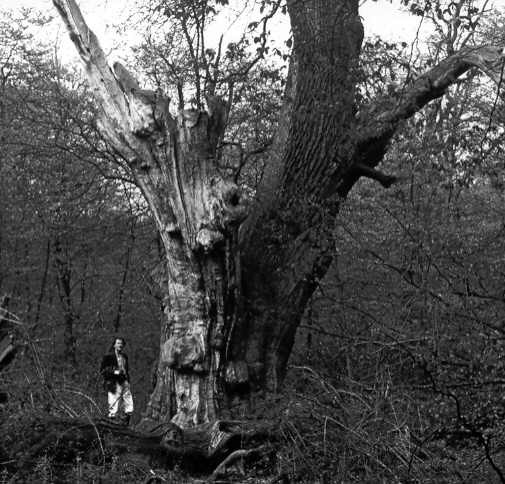 Of the hundreds of old oaks for wich the Hasbruch was famous there are some dozens left. 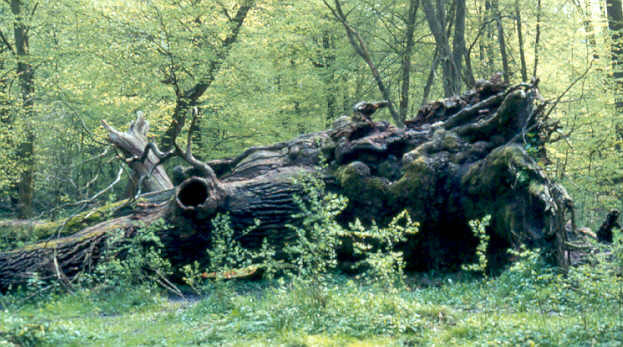 The biggest of all was the Amalien-Eiche ( Amalie Oak , named after a princes ), wich was blown over in 1982. It had a girth of 10 m (33 feet) and was thought to be 1250 years old, altough its growth in girth of 1,4 m since 1863 makes an age of 700 years more reasonable. It is left lying as a monument of nature and still is very impressive. 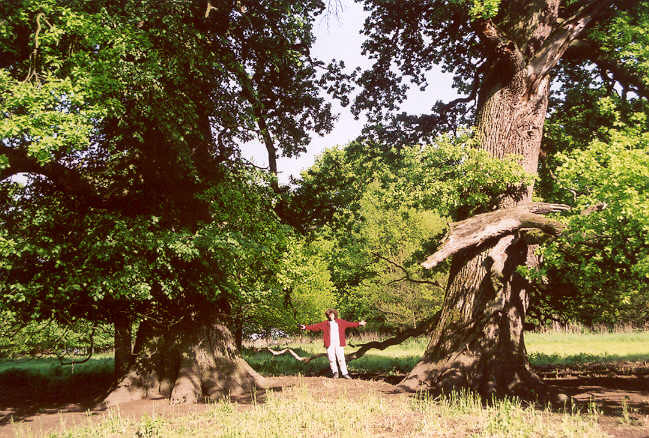 The Frederiken-Eiche ( Frederikes Oak) is the oldest and thickest Oak alive and standing in the Hasbruch since the fall of the Amalie Oak. In 1967 a large branch broke off in a storm. Since then half the tree is dead, but the other half is still very much alive and in full leave each year. It is 7,8 m (26 feet) in girth and should be 1200 years old, again to my opinion a not very relieble claim. 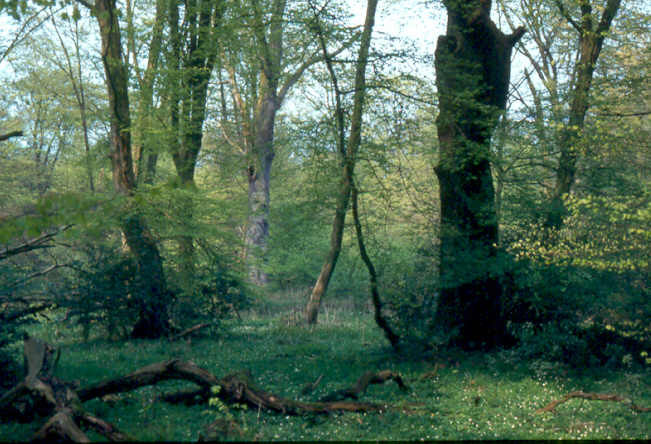 Comparable forest-reserves in north-western Germany are the Neuenburger Urwald and the Urwald Baumweg. A woodland wich still has the character of a open grazed forest of the so called "Hudewald" type is the Borkener Paradies (Paradise of Borken), near to the Dutch border. At the south-west-bank of the river Elbe, in the so called Wend-land, North-east of Hannover, lies a beautiful old deciduous forest called Elbholz (Elbe-wood). It lies in the area wich can be flooded, but partly it lies behind dikes. Here are two pictures of the forest outside the dike along the Elbe. It is an open, grazed forest of mostly Oak and some Elm, Black Poplar and Willow with Hawthorn and Blackthorn in the undergrowth.